It’s the last weekend before Christmas and, understandably, a lot of folks have big plans. But not me. I’ve got little plans. More to the point, this is the weekend I’ll bake up some little pies – pint size beauties which, judging from the joy they always bring, pay a ten gallon dividend. I trust I’m not the only one who always needs a baker’s dozen of last minute gifts, small but thoughtful tokens of appreciation for a favorite postman, shop owner, barber, or unexpected visitor. 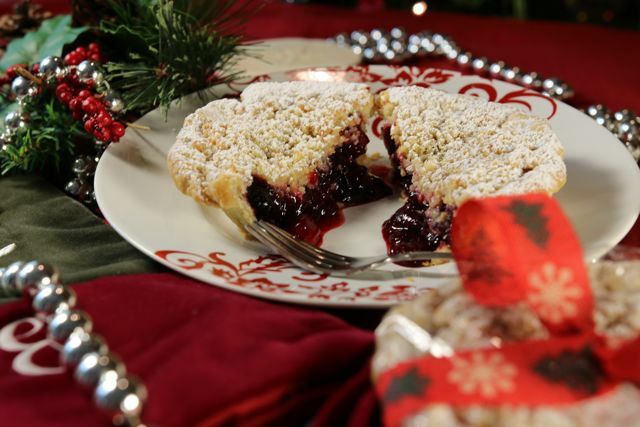 These little pies – I like to call them stocking stuffer pies – are just the ticket. I’ve been working on a new Pie Academy course on little pies; it’ll be out this coming year. 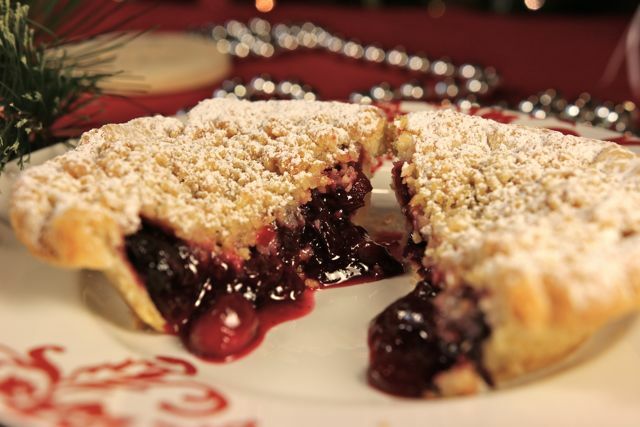 Meanwhile, here’s a recipe for my Cranberry Cherry Stocking Stuffer Pies. Not only are they delicious; the bright, jewel red filling and snowy dusting of confectioners’ sugar say “happy holidays” loud and clear. If you can find them, my favorite little pie pans for stocking stuffer pies are disposable aluminum pans about 4 1/4″ in diameter, 1″ tall, and hold about 1/2 cup of filling – about 3/4 cup when you build up the edge of the pastry the way you see here. (The pan I describe is the one on the lower left.) It makes the perfect one- or two-person serving. If you can’t find this exact size, try to stay as close as possible to it. (We’ll be selling this size in our online store shortly.) Depending on the size of your pans, you should be able to make 4 to 6 pies from the recipe below. 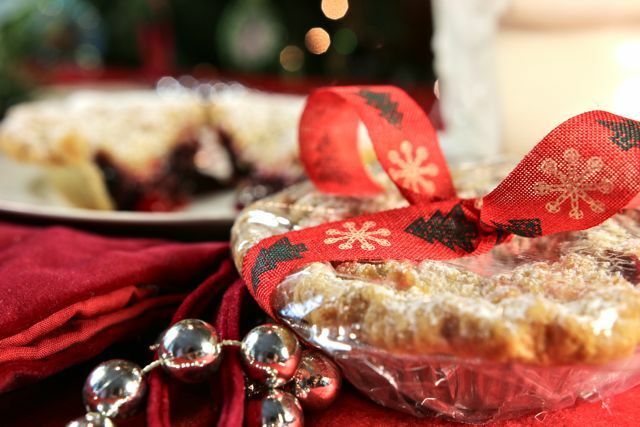 In addition to disposable aluminum pans, you can also find a range of inexpensive or – if the recipient is a pie maker herself – truly gift-worthy pie pans for the occasion. In any case, small is best, and be sure to steer clear of “deep-dish” pans because they’ll use up too much of your filling. A festive wrapping is the thing that makes your pies really special. My wife insists on taking over here, well aware – as she is – of my fondness for duct tape. She’s an artist with cellophane and ribbon. 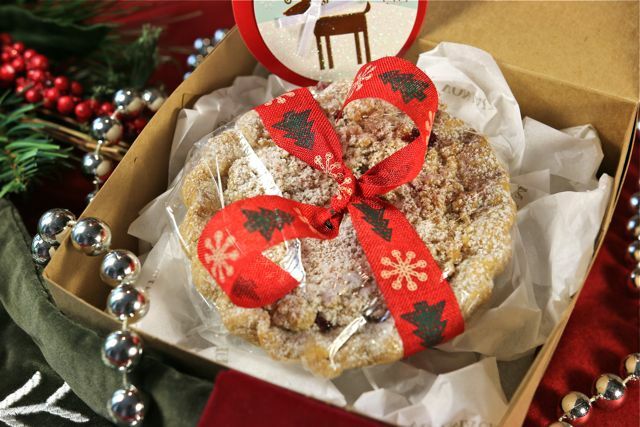 Our 6-inch pie boxes make our gift pies truly memorable. You’ll find plenty of cranberries in your market in the coming weeks, so now is the time to make these. Even if you can’t get to them before Christmas, steal some time for these little pies before the end of the month: they’re a really sweet way to ring in the New Year, too. Finally, thanks to all of you who helped support The Pie Academy through your recent holiday purchases of cookbooks, rolling pins, aprons, pie and tart pans, pie boxes, and other products from our online store. We appreciate your loyalty. We’ve had fun bundling up your parcels and communicating with you. And even if we can’t promise delivery before Christmas on items purchased now, if Santa leaves you an envelope full of cash this week, all purchases made this month will still get you a free cookbook. Details here. Prepare the pastry as directed, but divide it into about 5 equal pieces; or 4 pieces if your individual pans are a little larger, 6 pieces if they're on the small size. Shape into balls, then flatten into 1/2-inch thick disks on a floured surface. Wrap individually in plastic wrap and refrigerate for at least 1 1/2 to 2 hours before rolling. When the dough is ready, working with 1 piece of dough at a time, roll it into a 6 1/2- to 7 1/2-inch circle. Line one of the pans with your dough, shaping the overhang into an upstanding ridge. Flute the edge, if desired. Repeat for the other pieces of dough. Refrigerate all these shells. Let the frozen cherries sit in a bowl, at room temperature, until they've thawed just enough to halve them. In a large saucepan or other pot, combine the halved cherries, cranberries, 1/2 cup of the sugar, the orange juice, orange zest, and spices. Cover and heat slowly, gradually increasing the heat until the fruit has put off a good deal of juice and the cranberries are starting to make popping sounds. This could take 5 to 10 minutes. Stir occasionally. When the liquid reaches a low boil, pull it off the heat. In a small bowl, combine the remaining 1/3 cup sugar with the 4 teaspoons cornstarch. Mix well. Slowly add this mixture to the fruit, stirring as you add it. When all of the mixture has been added, put the fruit back on the heat and bring to a boil. Boil gently for 1 minute, stirring almost nonstop. Remove from the heat and transfer the filling to a shallow baking dish or casserole. Cool to room temperature, then refrigerate for at least 2 hours. Overnight is fine. Preheat the oven to 375°. Adjust the oven rack so it is one setting below the center. Get out a large baking sheet and place it on the rack, to preheat along with the oven. Get out the filling and shells. Add enough filling to each shell to come about 1/2-inch from the top of the shell. Spread a thick layer of the crumb topping over the filling. Put the pies on the preheated baking sheet and bake for 25 minutes. Reduce the heat to 350° and bake about 20 minutes more, until the topping is a light golden brown. 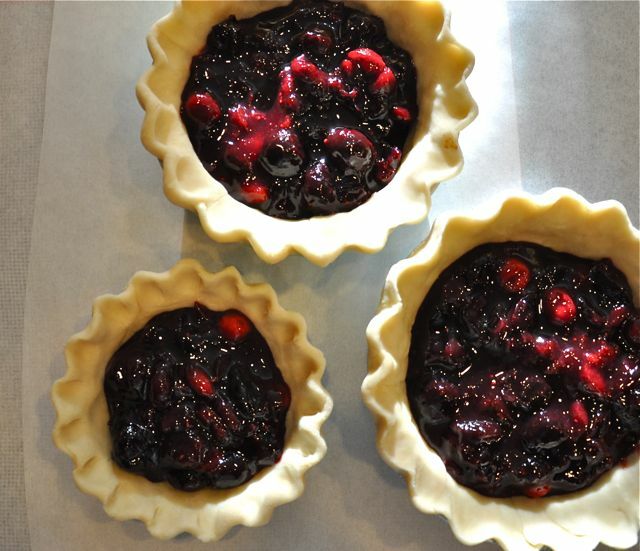 The filling may bubble up a little bit, but since it is precooked and pre-thickened, don't expect the sort of active bubbling you typically see with your fruit pies. If the tops aren't browning to your satisfaction, move the rack up for the last few minutes. Transfer your pies to a cooling rack. Cool thoroughly, then refrigerate. Just before wrapping, put a little confectioners' sugar in a fine sieve and dust the tops of the pies. MAKES 4 TO 6 SMALL PIES.